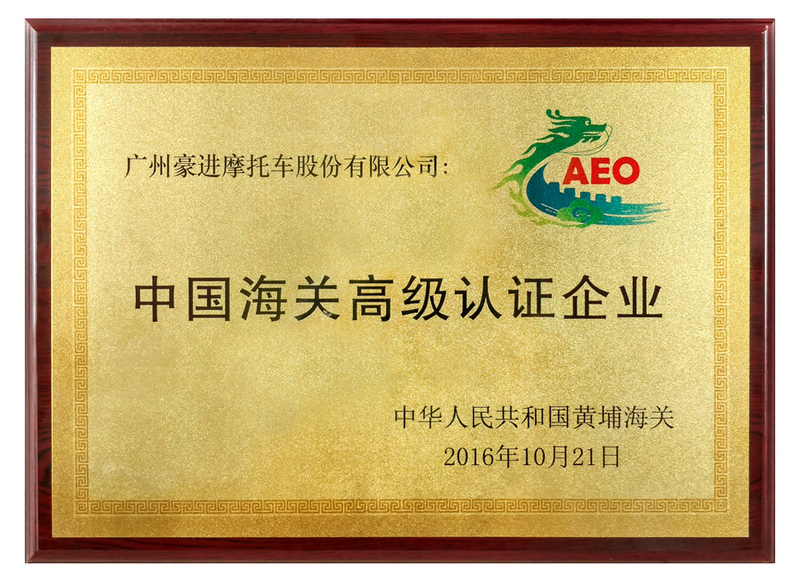 Authorized Economic Operator ( AEO) is highest credit rating of international trade enterprises jointly recognized by customs. It is not only worthy trusted by custom but also a model of good faith and advanced benchmark of international trade enterprises. According to the senior certification standard of AEO, only with qualified products, credit status, law-abiding and safety measures will be able to pass the certification and facilitate custom clearance. As for international trade enterprises, AEO is a golden sign. Haojin motorcycle always adheres to the brand principle “Great Haojin Great Motorcycle” and strives to bring more high-quality products to global customers. With advanced enterprise management, technology innovation, trust of customers, Haojin motorcycle was awarded the citification of “Authorized Economic Operator” which also means the process of haojin internationalization has been raised to new level.